[Updated] The Bermuda Nurses Association has announced that Kathy-Ann Swan has been named as the Nurse of the Year, honouring her for her more than 30 years of service to the good health of Bermuda’s residents. In responding to the recognition she has received, Ms. Swan said, “It is an honour. I think I took this for granted. What a recognition; I really appreciate this prestigious award. When asked what she loved most about the profession, Ms. Swan told Bernews, “I love nursing. I am passionate about nursing. Being a role model and mentor, assisting others to either improve or adjust, providing that caring, client orientated, professional environment, promoting nursing, assisting in educating and developing our future nurses into the profession. “The many opportunities in nursing that I have been given, working with so many different teams, meeting so many different people, and learning so much. Update 3.58pm: The PLP has offered its congratulations to Ms. Swan, with Shadow Minister of Health Ms. Kim Wilson saying, “The Bermuda Progressive Labour Party is today pleased to join Bermuda in celebrating the career and contributions of Kathy Ann Swan; the 2015 Nurse of the Year. “Nursing is an occupational field that is under-represented by Bermudians. It is an area where Bermudians can and should participate in and make careers for themselves. Mrs. Swan is a shining example of how with hard work and tenacity, Bermudians can reach the highest levels in this field. Congratulations, Kathy Ann Swan! You surely deserve this award. I will never forget your care for my mother when she was in the Extended Care Unit. Blessings, my dear. Congratulations Kathy!! You so deserve this. I am so happy for you.! 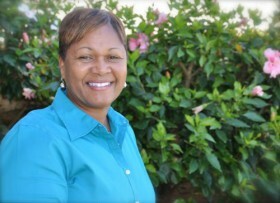 A Nurse Trail Blazer for Nursing Education in Bermuda.